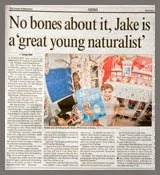 You are here: Jake's Bones > So why do deer even have antlers ? When I gave my talk a few weeks ago at Crieff Library I talked about deer antlers, and passed round some shed roe deer antlers for people to look at and feel. At the end, someone asked: "why do deer have antlers anyway ?" It's a simple question but it's also a difficult question at the same time. There are some obvious answers, but when you look into them, they don't apply to all deer. I've written a lot about antlers before (like explaining how roe deer antlers grow, when the antlers 'go back' and when they grow strangely) but I've never looked into why they have them in the first place before, and the reason is more interesting than you might think ! Having antlers is completely bonkers. Deer spend most of their day chewing grass, plants and heather in order to get the nutrients they need. After they chew and swallow it, they sit and regurgitate it to chew it some more. 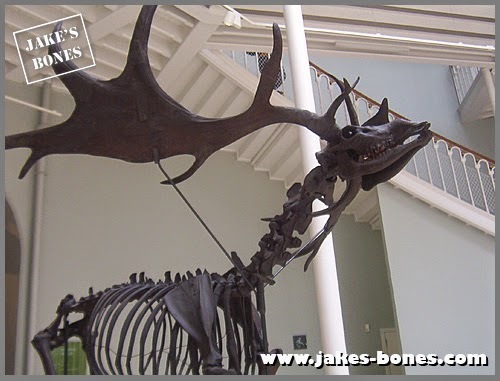 They have to do a lot of work to get all the nutrients they need, even chewing bones and old antlers to get calcium. But for three months of the year, some of these nutrients are used to grow antlers. That's a waste of food. The antlers are fragile at first, and have to be carefully looked after, so they can't be used properly. Then, after nine months, they fall off and become useless, and have to be grown again. Being a deer is a bit like spending three months wages on a new hat, which is incredibly heavy, waiting three months for it to be delivered, then throwing it away again after nine months. And if you have a nice hat, someone might shoot you for wearing it. That's how stupid antlers are. And that's not even the most stupid part. 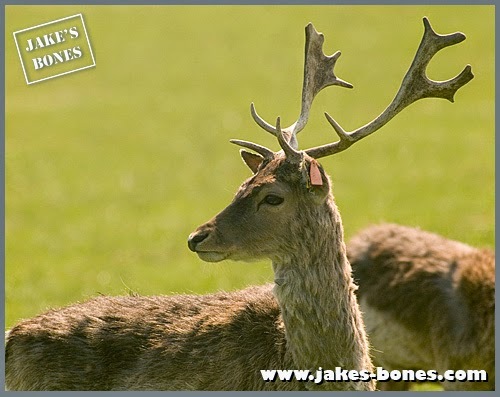 Red, sika and fallow deer have big, wide antlers. And they often live in woods. With branches and trees close together. 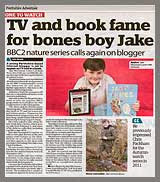 It's a bit like carrying a ladder across your shoulders while moving around at home. Antlers are so bonkers that there must be a really, really good reason for having them at all. Are they for fighting other deer ? In the mating season, the males fight over the females with their antlers. They lock the antlers together to see who is the strongest. The strongest deer gets the most females. FOR: This happens. I have seen it. 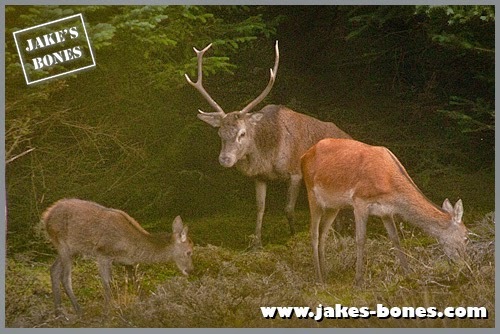 Red deer are famous for having the 'rut', but sika and fallow deer have one as well, and roe deer fight over territory (like above). 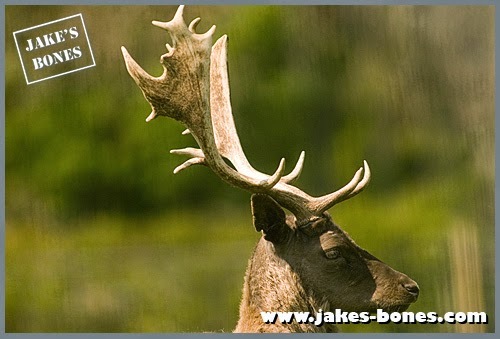 AGAINST: Roe bucks and red deer stags may fight, but they rarely lock antlers. In the fight above, the roe deer didn't connect antlers once. And not all male deer have antlers (Chinese water deer don't). 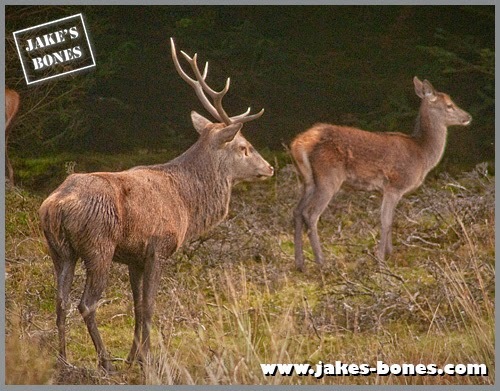 You don't always need antlers to fight (females, and red deer in velvet can 'box' with their front legs to fight). And it doesn't explain why female reindeer have antlers as well. Also, red deer only lock antlers as a last resort, and they try to size up their opponents before. Are they for telling male and female deer apart ? AGAINST: Lots of animals, like foxes and badgers, look identical but know who is male and who is female without having to use antlers. And it wouldn't help reindeer (both males and females have antlers) or Chinese water deer (neither do). What they look like: Around 30cm, almost always with three tines (spikes) in adults. The antlers are also oddly positioned, so they can't be used to scrape the ground, for example to move snow off vegetation. Which is just as well, because the antlers can't be used when there is snow on the ground anyway because they are still growing. 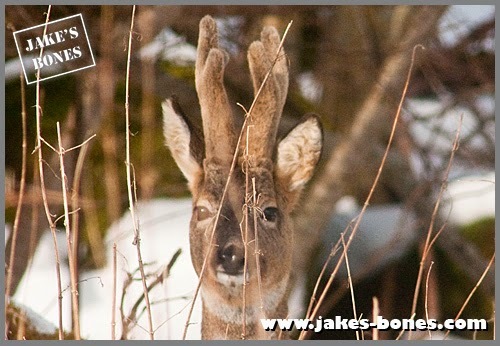 Roe deer can use their antlers for fighting but they tend not to. 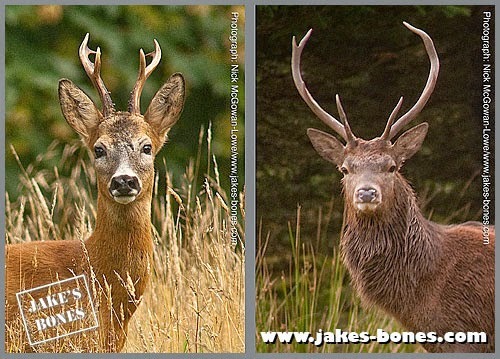 The sequence of photos below shows two roe buck fighting. These pictures were taken in May, and this timing is important. They fight over territory just when the antlers have finished growing. So maybe it's important the antlers grow over the winter so they are ready for fighting for territory in May. 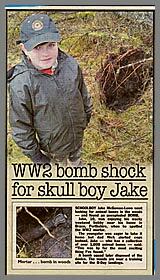 So maybe the antlers are a sign, rather than a weapon. 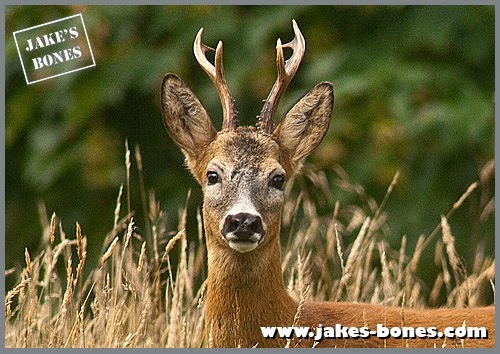 An adult, strong roe deer with access to lots of good vegetation for eating shows other roe bucks that he is likely to be tough to fight, and shows females that he is healthy and likely to be able to provide good food for them. 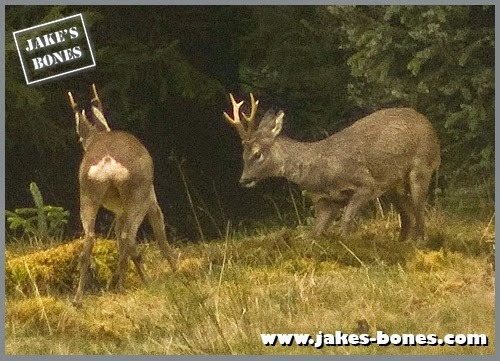 What they look like: Around 70-115 cm, amount of tines varies 2-18. This is what most people think of when you mention deer antlers. Red deer antlers get more complicated with age, starting with two spikes, and getting up to 30 different points when the stag is at his prime. 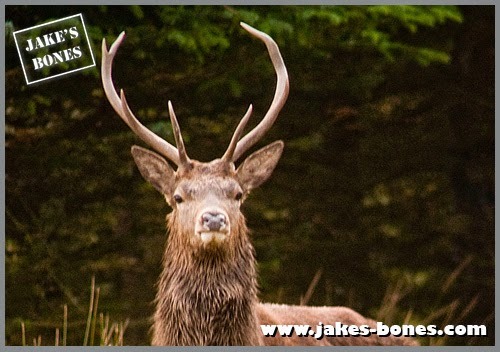 Red deer antlers are shed in April, and grow over the summer so they are ready for when the rut starts in September. Red deer antlers are definitely used as weapons (see my post on the fight between Homer and Flanders last year) but they also act as a signal to other males about how strong that deer is, so they can settle things without fighting. The antlers probably aren't a good signal to females, because females don't seem to have much say in which male they mate with, unlike female moose (cows) who mate with the male (bull) with the biggest antlers. What they look like: Around 60-95cm. Palmation (broad, flat areas) at the top of the antler in adults. The antler cycle: Shed in late April/May. Fallow deer have this lovely palmation on their antlers. 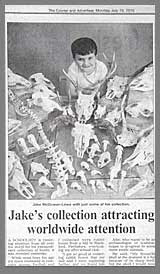 It makes them look distinctive, because they are the only UK species with palmation. None of my books explain why the antlers grow like this, but in moose it's thought maybe they reflect sound back onto the ears and so help them hear things from a long way away. 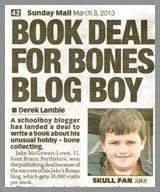 But this seems unlikely with fallow. They have the same front-facing tines at the bottom of the antler, like red deer, possibly to help them fight other males. Fallow deer rut at the same time as sika and red deer, so it's likely their antlers are used for the same reasons I gave for red deer above. 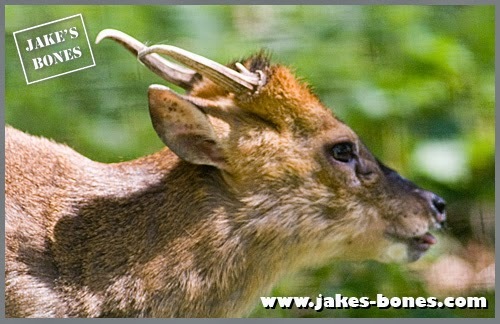 Muntjac are small deer, and you don't get them in the wild around where I live. They are thought to be one of the most primitive types of deer. Their antlers are very unusual, and the pedicles are long and point backwards on the skull. The antlers are small, like a spike with a small tine at the base, but they mainly use their large canine teeth for fighting. Most other deer only have a very tiny canine tooth, or usually none at all. The antler cycle: Males shed in late December. Grow back in January. 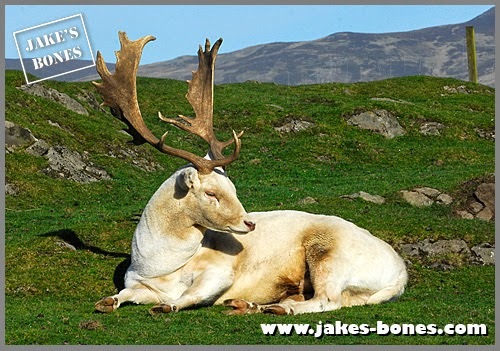 Females keep their antlers until May. Reindeer are unusual for two reasons. They are the only deer where males and females both have antlers, and also their antlers are very complex. They are well adapted to snow with much wider hooves. So why do females have antlers as well ? 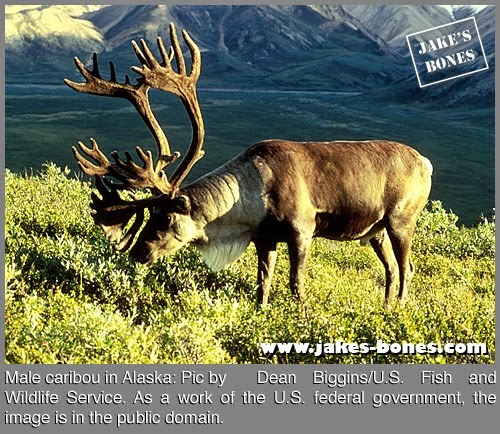 One reason is that if you look at reindeer antlers, they have a broad palmate branch which comes over the nose and which can act like a shovel for moving snow and finding vegetation underneath. This would be something useful for both males and females. But the unusual thing is that the males shed their antlers in early winter, Male reindeer antlers are quite heavy, so maybe it's worse to have the extra weight then. Female reindeer antlers are much lighter, so maybe it's less of a problem for them. They shed their antlers after the winter. This also proves Santa's sleigh is pulled by female reindeer, if you think about it. So....there are lots of reasons why deer have antlers: sometimes for fighting, sometimes for attracting females, sometimes as a signal to other males, and sometimes for clearing snow ! It just depends on the species. This was a very interesting post. I love antlers, they are so fascinating! I love the antlers too - it's one of those cool nature things that we take for granted, but then when we think about it - it's so unusual and neat! 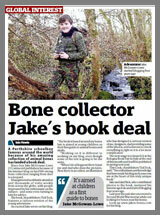 They are slightly bonkers too, especially in bigger deer, they are incredibly heavy and difficult to carry around.